Standard shipping rates apply to Lexan windshields and hard roofs. Call our toll-free number to order and spread your purchase over 3 months. See our Ordering Information page for offer details. Kawasaki Mule 3010-After Market Full Cab Enclosure-Retail Value-$799.99-ON SALE NOW for $569.99! Kawasaki Mule 3010 After Market Lexan Windshield-Retail Value-$499.99-ON SALE NOW for $399.99!! Kawasaki Mule 3010-After Market Door/Rear Window-Retail Value-$624.99-ON SALE NOW for $509.99! 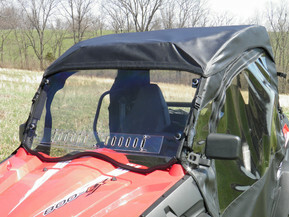 Kawasaki Mule 3010-After Market Summer Cab-Windshield/Top/Rear Window-Retail Value-$459.99-ON SALE NOW-$319.99! Kawasaki Mule 3010-After Market Windshield/Top-Retail Value-$409.99-ON SALE NOW for $299.99! Kawasaki Mule 3010-After Market Top Cap-Retail Value-$149.99-ON SALE NOW for $114.99! Kawasaki Mule 3010 After Market Full Cab Enclosure w/2 PC Lexan Windshield-Retail Value-$1,024.99-ON SALE NOW for $899.99!